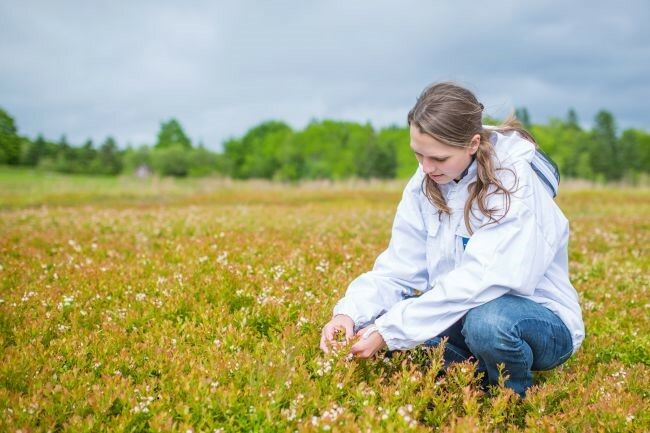 Apiculturist Robyn McCallum is seen working in blueberry field on a project aimed at strengthening and expanding the honey bee population in Atlantic Canada. BIBLE HILL – A “unique” team of specialists based in Bible Hill are working to strengthen and grow the honey bee population in Atlantic Canada. Called the Atlantic Tech Transfer Team for Apiculture (ATTTA), the team, which is based at the Perennia Food and Agriculture facility, is beekeepers and members of the blueberry industries to review current honeybee management practices across the country in an attempt to customize it for the region’s more than 38,000 commercial bee colonies and nearly 39,000 hectares of blueberries. 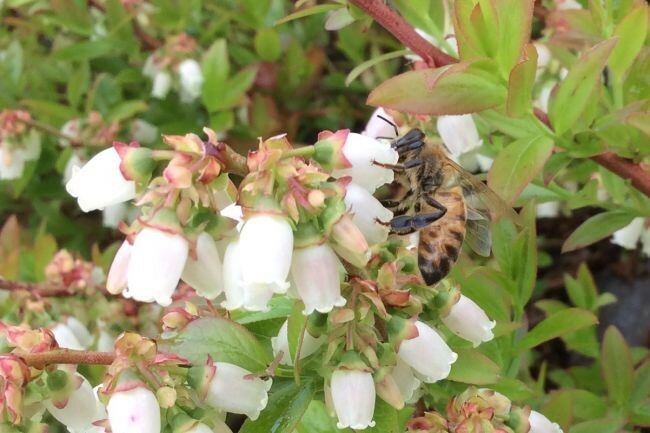 “The bottom line is improving and building the pollination capacity of honey bee hives for low-bush blueberry pollination, said apiculturist Robyn McCallum who is working with Cameron Menzies on the project. Atlantic Canada is one of the world’s largest producers and exporters of wild blueberries. For the industry to continue to expand, however, the number of commercial bee colonies will have to more than double to 100,000 hives by 2025. The project team is working to support improved productivity in the wild blueberry, beekeeping and pollination industries by helping regional beekeepers expand hives and increase hive density to meet the increasing demand for pollination in wild blueberry fields. The Government of Canada and the provinces of Nova Scotia, New Brunswick and Prince Edward Island are investing $355,000 in the team through Growing Forward 2, a five-year, federal-provincial-territorial policy framework to advance the agriculture industry. A number of industry organizations, including the Nova Scotia Beekeepers’ Association, Wild Blueberry Producers’ Association of Nova Scotia and Oxford Frozen Foods are contributing another $54,000 to the two-year project. Overwintering survival rates are a factor, McCallum said, so the team is looking at some techniques to be tested and shared with the industry to improve those numbers. The team also wants to work with new beekeepers to the industry as well as looking at what treatments are most effective along with any new ones being introduced. “We’re also working with improving honey bee health and nutrition,” she said.